Our Business Plan allows (1) hashtag to be tracked. Our Premium Plan allows (3) hashtags to be tracked. For additional hashtags, please contact us. Use our hashtag feature to collect hashtag entries from Instagram and Twitter for your promotions. You can accept hashtag entries for sweepstakes, or hashtag entries for contests with the ability to choose media type that must be submitted (like photo and video). Included in the Premium plan is 3 hashtags per account at any given time, with 1 hour updates. If you need additional hashtags, or need faster updates, please contact us. To configure the hashtag feature, simply go to the Hashtag Entry section on your campaign and click +Add Hashtags. Add up to 3 hashtags, separated by comma. Choose the dates to start and stop importing hashtags, and choose which networks to pull hashtags from. Finally, select which media types you want included with the hashtag. 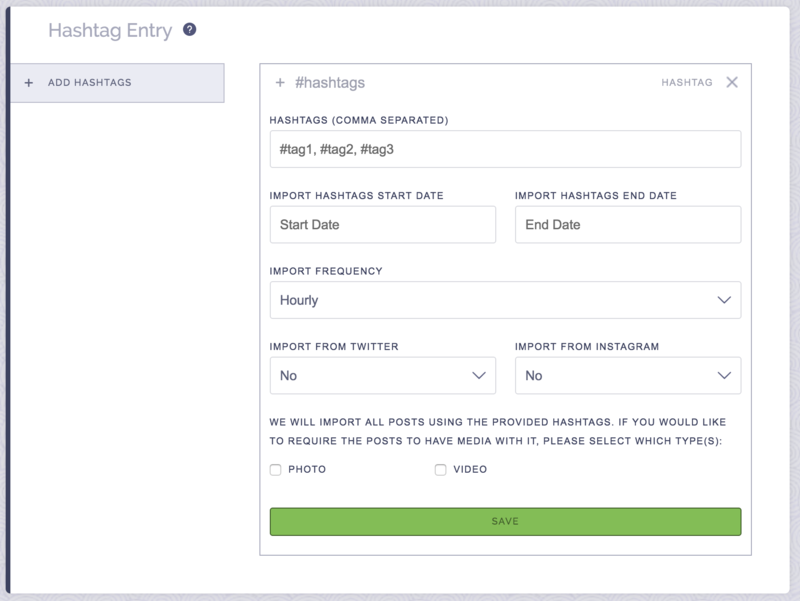 Once you save the hashtag, we will automatically begin pulling hashtag entries on the indicated start date, and we will automatically stop pulling hashtag entries on the indicated end date. I want to use hashtags for entries but I'm not sure if I should set it up under sweepstakes or contest. Which is best for me? If you want to collect photos and videos of people using your hashtag, then use the contest option instead of the sweepstakes option. Can I collect entries via your form and also collect entries via a hashtag? Yes! However, when you collect entries via a hashtag you only get the username of the user, a link to their profile, the photo or video they submitted, along with the caption/comment -- you do not get any information such as name and email address. I just want to collect entries via a hashtag, but it is asking me to input all of this information. We still require you to input a title, start and end dates, # of winners, and rules in order to proper set up and structure the promotion. If you just want to collect entries via a hashtag and you do not want to use our entry form, you will still need to set it up like a normal promotion in order for the hashtag feature to work. Some users hashtag submissions are not appearing, why not? If a users profile is set to private, we cannot pull in their hashtag submission. In addition, if a user has submitted a hashtag submission, then deletes their post, we will no longer be able to display the submission within ViralSweep. Where do I view the hashtag photos and videos? If you set up a hashtag contest, these can be viewed by logging into your account and going to Entrants > Moderate. Still having trouble with our Hashtag Entry feature? Simply click the support or live chat icon to get in touch with us.